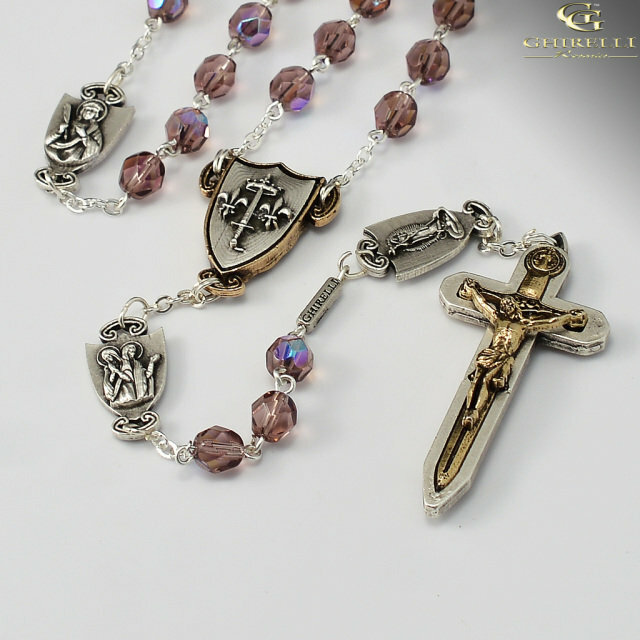 Designed by the author of the book, Called to Knighthood, Thomas K. Sullivan, and manufactured by premier Italian rosary maker Ghirelli -- creators of our Holy Father’s Official Papal Gift Rosaries, The Warrior's Rosary is the only one-of-its-kind design spanning over 10 years. This Warrior's Rosary brings together the elements of "Military Combat" & "Spiritual "Warfare", and places one of the most powerful weapons in spiritual warfare into your hands. It is Time to Begin Your Christmas Shopping Now! Give the Gift for the Heart and Soul, A "Warrior's Rosary". Order NOW! 7mm Amethyst Bohemian glass faceted beads with aurora borealis effect.